The globalization of the National Basketball Association has been a multi-layered process: part geographic, part linguistic, part stylistic and part philosophical. Not only has the league that was born in the United States expanded to have a team in Canada, it now welcomes players from all over the map; six of this planet’s seven continents are currently represented on NBA rosters. (We’re still waiting for a hoops phenom from to emerge from Antarctica.) That means that on any given night during the NBA season, basketball is being translated — by players and coaches to each other, and by broadcasters to fans — in several different languages. It also means that distinct styles and philosophies (on and off the court) from all corners of the globe are constantly being added to the mixture that makes up the highest level of basketball on this planet. What the NBA’s globalization has not been is a movement toward religious diversity. But that’s only because decades before the NBA grew from a national pastime to an international craze, the league was already familiar with a melting pot of religious beliefs. And the league was certainly no stranger to Islam and no stranger to Muslim superstars. Kareem Abdul-Jabbar, who played in the NBA from 1969 to 1989, is still the league’s all-time leading scorer; he is arguably the greatest basketball player in history and arguably the most popular Muslim athlete after boxing legend Muhammad Ali. Hakeem Olajuwon, who played from 1984 to 2002, is a former Most Valuable Player and two-time champion. Abdul-Jabbar and Olajuwon are both members of the Naismith Memorial Basketball Hall of Fame. Other Muslim NBA standouts from years past include Mahmoud Abdul-Rauf, Shareef Abdur-Rahim, Larry Johnson, Mahdi Abdul-Rahman (a.k.a Walt Hazzard) and Zaid Abdul-Aziz. The fact of the matter is that Islam was part of the NBA mosaic before Air Jordans, before dunk contests, and before the three-point shot. And it remains part of the league today. Al-Farouq Aminu, forward, Dallas Mavericks: Playing on his third team in five seasons as a pro, and mostly as a backup, Aminu might be considered an NBA bust by some — he was taken with the No. 8 pick in the 2010 draft — but he will have a job in the league for a long time due to his raw skill set and tantalizing potential. Aminu’s rebounding, defense and speed on the wing have kept him in the Mavericks’ rotation, averaging 5.6 points and 4.6 rebounds in just over 18 minutes per game. While this will be Aminu’s first NBA postseason experience, he is not unfamiliar with playing on a big stage. Born and raised in Atlanta, Ga., to Muslim Nigerian parents, Al-Farouq played for Nigeria in the 2012 Olympics, where — playing alongside his brother Alade — he led the national team in assists and steals. It might also be a good sign for the 6-foot-9 Aminu that the Mavericks have drawn the Houston Rockets as their first-round opponent. Aminu played his best game of this season against Houston, when he put up 17 points, 12 rebounds and two blocks in a Feb. 20 Dallas victory. Omer Asik, center, New Orleans Pelicans: Asik’s five-year NBA career has been series of promising starts and frustrating stops. 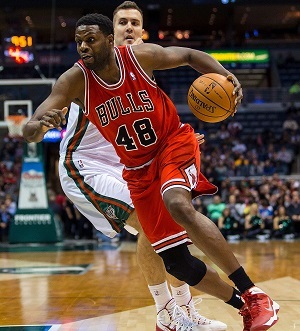 He was drafted by the Portland Trail Blazers in 2008, but was traded almost immediately to the Chicago Bulls as part of a three-team deal involving spare parts and second-round picks. After playing two more seasons in his native Turkey, Asik joined the Bulls in 2010 as a little-used backup to eventual All-Star center Joakim Noah. Asik left Chicago and signed with Houston, where the seven-foot powerhouse became a full-time starter and led the NBA in total rebounds during the 2012-13 season. As good as Asik was, it didn’t stop the Rockets from pursuing and procuring the league’s top prize in the free-agent class of 2013, superstar center Dwight Howard. Relegated back to the bench, Asik played one injury-plagued season as Howard’s backup before he was traded to the Pelicans. In New Orleans, Asik has regained a full-time starting job, averaging 7.3 points and 9.8 rebounds this season. His gritty play in the paint complements star power forward Anthony Davis’ all-over-the-court versatility. Asik, who averaged a double-double in the 2013 playoffs for the Rockets, helped the Pelicans reach the playoffs for the first time in four years, where they’ll face the No. 1 seed Golden State Warriors in the first round. At 6-foot-10, Ilyasova is a tough but skilled athlete — almost like a hockey player on the basketball court — who is just as likely to grab 10 rebounds on any given night as he is to hit three or four three-pointers. Nazr Mohammed, center, Chicago Bulls: The 37-year-old won an NBA championship with the San Antonio Spurs in 2005, won two national championships at the University of Kentucky, and is now aiming to finish his accomplished career with another ring from the Bulls. Mohammed doesn’t play much — he has appeared in just 23 games this season and averages only five minutes of floor time when he does get in — but he is a universally respected leader and fan favorite in Chicago, which is not only his hometown, but also where he is known for his extensive charity work in the community. The Nets have not indicated how much Teletovic will play — or if they’ll let him play at all — but considering the tough test they’ll be facing in the first round against the Eastern Conference’s No. 1 seed Atlanta Hawks, there’s a good chance the 6-foot-9 three-point shooting specialist makes an appearance. Teletovic averaged 8.5 points per game this season, and was one of Brooklyn’s breakout performers in last year’s playoffs. Hedo Turkoglu, forward, Los Angeles Clippers: The 36-year-old veteran has played on two of the most highlight-friendly, crowd-pleasing teams of the 21st century. Turkoglu came into the league with the early-2000s Sacramento Kings, led by Chris Webber and Vlade Divac, whose slick passing and modified Princeton offense dumbfounded opposing defenses and regularly pushed the Shaq-and-Kobe L.A. Lakers to the brink. These days, Turkoglu is winding down his career with the “Lob City” Clippers, led by Chris Paul and Blake Griffin, whose fast-break style and nightly dunk contest reenactments have made them a strong contender in the Western Conference. Like he did in Sacramento, Turkoglu comes off the bench in L.A., where his outside shooting (43 percent from three-point range), ball-handling and playmaking ability may come in handy in the Clippers’ first-round matchup with the defending NBA champion Spurs. Shaquille O’Neal, analyst, TNT: Shaq retired as a player four years ago, but he is still one of the most visible sports personalities on this planet. It seems you can’t go a day of TV-watching without seeing the four-time NBA champion and three-time Final MVP in one commercial or three, hawking everything from Gold Bond cream to Buick cars. Shaq has a reality TV show, has appeared in several movies, and has released a handful of hip-hop albums. He will be all over your television screens, computer monitors and smart phones during these playoffs in his role as a studio analyst for TNT and NBA TV. EDITOR’S NOTE: Soon after this article was re-posted on MuslimMatters.org, I learned that Atlanta Hawks point guard Dennis Schroeder is a practicing Muslim. Schroeder averaged 10 points and 4.1 assists per game this season, backing up All-Star PG Jeff Teague and helping the Hawks to the best record (60-22) and No. 1 seed in the Eastern Conference. The 21-year-old Schroeder was born and raised in Germany.